I remember a time when side-scrolling games were at the top of their game. They were the epitome of videogames. You had games like Super Mario Bros. which was all about the platforming and then you had games like Double Dragon where action was at its best. Zack Zero is a game that tries in many ways to give you the best of both worlds while modernizing it, but it does so with mixed results. You are tasked with helping our hero, Zack Zero, save his beloved Marlene who has been kidnapped by the evil Zulrog so that he may obtain a powerful concoction that will give him the ability to travel into the past. The story is told through some great animated cutscenes that look straight out of a morning cartoon. It's a classic storyline to give you that classic feel of days past. However, the story isn't all that compelling. The first thing you'll notice about Zack Zero is how lively the game looks. The game has some great visuals and those will easily gain anyone's attention. 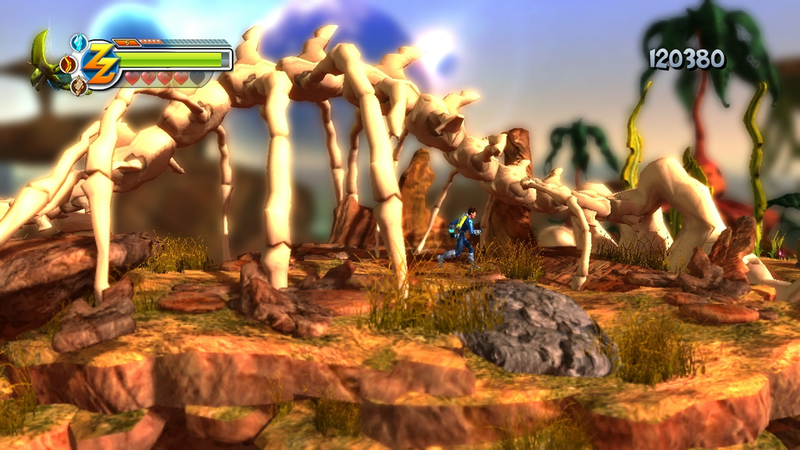 The 3D graphics are meant to complement the 2D style and the result is a very good looking game. Every move in your arsenal looks cool when you perform it, and the creatures are unique and interesting to look at. The environments mix in beautifully with the characters and the world definitely feels like it has some life in it. Zack Zero has a lot of good ideas, but the overall gameplay is kind of generic. You have different powers representing Earth, Ice, and Fire with each bringing a secondary power with it in addition to your regular blade attacks. For example, Earth gives you extra strength so you can pull levers or Ice can slow down time. There is just not a huge focus on using these powers in normal combat, which is pretty straight forward. What should be a fun time just turns into fighting waves of enemies, and it doesn't really change much throughout the experience. Playing as Zack is kept simple with the combat, but it might be too simple and not really rewarding. There is a level up system, but it never feels like the core game changes when your powers are improved. Even the boss fights are about dodging attacks to get the opening and nothing more. The gameplay never gets exciting and you just feel like you're going through the motions when you play it. I ended up just using the basic blade attacks most of the time. Jumping around was simple and easy to get the hang of and it was cool to see this great looking world in motion, but the overall gameplay experience just wasn't all that fun. Ultimately, I think Zack Zero has a lot of great things going for it. The visuals are top notch and the character designs are clever and original. I thought the animated cutscenes were great even though the story was lacking. The game just looks better when you're watching it and I just wish it was more fun while playing it, but I will come back to see what these guys do with their next game. This review is based on the Steam version of the game provided by Crocodile Entertainment.